A supremely precision engineered lightweight slimline case in black with a perforated mesh pattern that looks great, adds grip and aids heat dissipation from your Samsung Galaxy Note 9, as well as enhance the high performance beauty of the device. I had initially bought the case and after taking it off the phone and putting it back again it cracked in all four corners. Blaming myself being a gorilla, went ahead and bought another one. FFW 1 week later I dropped my phone on the desk from ~15cm and the new case simply shattered. It's too bad that the color finish and feel are amazing, the material is more fragile than glass and at the first kink it just shatters. Good looking and slim fit, but easily broken on top corners . My case has been broken in three days only put in and pull out a few times. While this cover is slim and relatively nice looking, the flimsy button protectors broke off immediately on first use as they are essentially very thin pieces of low quality plastic connected to the rest of the cover only on one end. Even so I decided to use it since it was working ok without the button protectors. However, when I tried to take it off after 5 days of use to clean the phone, it cracked at the top right corner and I must now replace it. Olixar usually has great products but unfortunately this one is a fail. 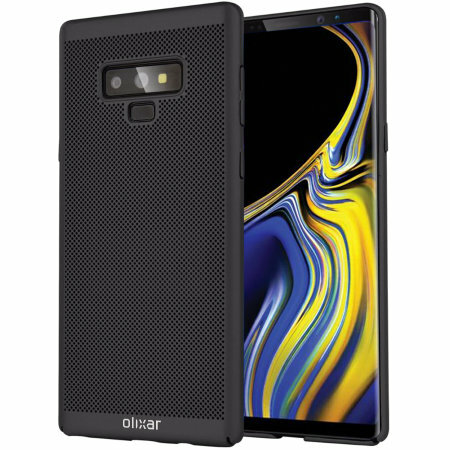 Wish I knew about the Olixar mesh case when I had the note 8. I'm liking the thin fit and the blue color. Great case. The top left edge broke in a few days. A crack is seen on the top right edge also. The fit was good. But the cutout for charger is a bit tight, the official charger wouldn't go in fully. Occasionally popup message that the charger not connected properly appears. Very slim case. Looks great! Build quality is ok. Loved it at first. Very light and thin as expected. Actually better than expected. But really disappointed that the top right soon started showing a crack and today a small piece chipped off. It never dropped or hit anywhere. Terrible case cracked at the top after only 2 days,I do not recommend this case save your money, great service and support by mobilefun. The case has only lasted a week, there were stress fractures in the corners of the case which eventually led to the case breaking. Only lasted a few days. Not sure how it got cracked as I'm VERY careful with my phone. Broke within one week of normal use. Sorry to hear that, can you please contact our Customer Services team so we can look into this for you. Applies easily and looks very nice. Buttons work well and outlets and pen accessible but realistically has little protection for the phone. The red metallic finish is starting to wear off the button covers revealing white underneath at 3 weeks of use. Very fast and efficient service. Nice to have the product within a few days of ordering. Unfortunately the case has cracked in both corners at the top of the phone, I know it wasn't the most expensive of cases but it has definitely not been dropped or anything. Seems to tight of a squeeze getting the phone in the case. Shame. Sorry to hear you are not happy with this case. Can you contact our Customer Services team so we can look into this for you? This case really looks good on the phone and colour matches perfectly, but that is all . NOT much impact protection.Dropped on soft wooden surface from knee height ( about 2ft) with phone .The case sustained two hairline fractures, one on each side of case .Literally how far before it stop protecting the phone. This case is a compact fit and feels nice. Works well with a tempered glass screen protector. Ideal for light use, but to be honest i really don't think it will offer much protection if the phone is dropped. My advice would be to go for the Spigen Tough Armour case. Considering the Spigen is only £5 dearer it's worth the extra. Your Galaxy Note 9 costs £900 so it's a small price to pay. this just came and its not that blue its a dark greeny blue nothing like in the picture, its very plasticy i thought it would be more rubbery and flexible, the top of it fits well but the bottom doesnt line up properly, almost cant get the s pen out because of it which means the lip doesnt go past the screen height which is a problem at the bottom, it is thin which feels good in the hand but thats it, i will be sending this back. Very happy with this item, fits perfectly & looks great.